Something nasty is lurking in the forest in what might be the most frightening film of the year, a nerve-jangling mix of The Witch and Hereditary, from formidable first time director Lee Cronin. 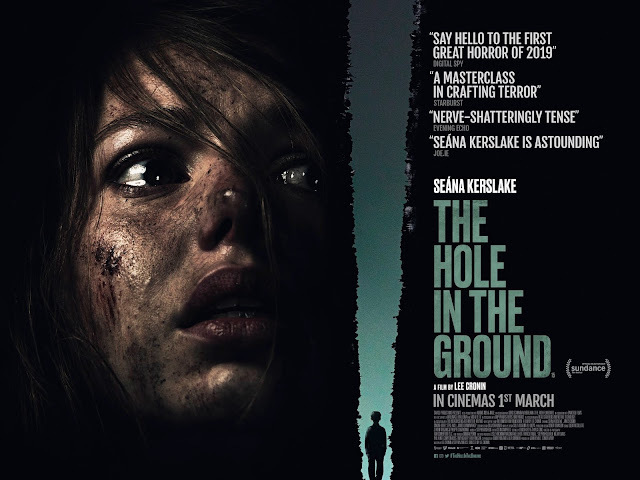 Directed by Lee Cronin, THE HOLE IN THE GROUND stars Seána Kerslake, James Quinn Markey, Steve Wall, Eoin Macken and James Cosmo. A bold and brilliantly constructed cross between Pet Sematary and Invasion of the Body Snatchers, the debut feature from writer-director Lee Cronin is a genre game changer that masterfully builds the tension, delivers the frights and leaves the audience reeling. Trying to escape her broken past, Sarah O’Neill (Seána Kerslake) is building a new life on the fringes of a backwood rural town with her young son Chris (James Quinn Markey). A terrifying encounter with a mysterious neighbour shatters her fragile security, throwing Sarah into a spiralling nightmare of paranoia and mistrust, as she tries to uncover if the disturbing changes in her little boy are connected to an ominous sinkhole buried deep in the forest that borders their home. We are delighted to share with you an exclusive new clip for forthcoming theatrical release THE HOLE IN THE GROUND and below that you can watch the official trailer for the movie. THE HOLE IN THE GROUND will arrive in cinemas across the UK and Ireland on 1st March 2019 from Vertigo Releasing and Wildcard Distribution.